New Mexico is known as one of the Mountain States and is the 5th most extensive state in the United States. Also called ÒThe Land of EnchantmentÓ, New Mexico has many attractions and tourist destinations. The bordering states are Texas, Oklahoma, Arizona, Utah and Colorado. 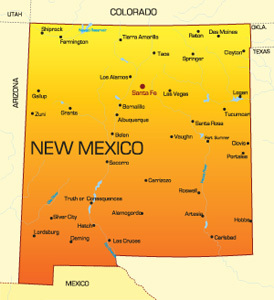 The capital city is Santa Fe but the largest city is Albuquerque, which has a population of 555,000 residents. The major highways running through the state are Route 66, I-10, I-25 and I-40. Notable colleges in the state are Eastern New Mexico University and the University of New Mexico at Albuquerque. Attractions like the New Mexico Museum of Art bring in tourism into the state as well.